Javier Hernandez has refused to commit his future to West Ham after the arrival of new manager Manuel Pellegrini. Hernandez signed a three-year Hammers contract last summer as he completed a £16m move from Bundesliga outfit Bayer Leverkusen. But the 29-year-old striker lost his first team place towards the end of the season when he was sparingly used by former boss David Moyes, and it has been widely reported that he could leave the Premier League club this summer. 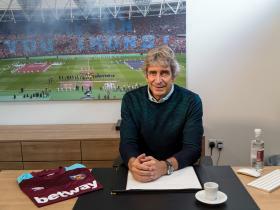 West Ham this week appointed Pellegrini as Moyes’ successor, but it remains to be seen whether the Mexico international will play for the former Manchester City manager. “Of course I am a West Ham player still, but we’ll see,” Hernandez replied when asked about his future at a press conference in Los Angeles ahead of Mexico’s friendly against Wales on Tuesday morning. “Right now what can I tell you? I’m glad there’s a new manager? I’m sad there’s a new manager? Hernandez was more forthcoming about Mexico’s final pre-World Cup opponents and a reunion with his former Manchester United team-mate Ryan Giggs, the Wales manager. A crowd close to the Pasadena Rose Bowl’s 90,000-capacity is expected as Wales seek to avenge the 2-0 defeat suffered to Mexico in New Jersey six years ago. “It’s going to be very good to see Ryan again,” Hernandez said. “Ryan is in a new role now and to be manager of his country is great. “But the most important thing is we are preparing well, we know we are going to the World Cup and Wales aren’t. “But that doesn’t mean we are not taking them seriously, we will be very respectful and we want to improve compared to our other previous matches.